The Unequal Nine Patch quilt block pattern is actually a framed four-patch quilt block in disguise. 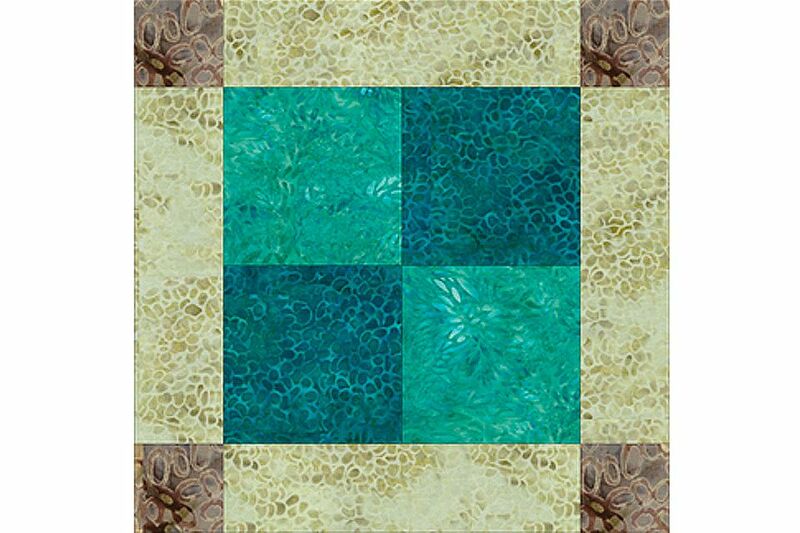 The framed quilt block finishes at 12-inches square and the example is made with batik fabrics in shades of browns and teal. Feel free to alter the fabrics in any way you wish. Each quilt block requires minimal fabric, making the pattern a perfect choice when you'd like to make a scrap quilt from your unused stash of fabric. Choose two teal fabrics, one lighter than the other, for the four patch quilt block that's sewn at the larger block's center. Select a medium to dark brown fabric for corner squares, and a light greenish (or neutral) fabric for the long bars of the frame. You'll find instructions for a lap quilt on the last page of this pattern. Sew the two 4-1/2" x 9-1/2" strips together lengthwise as shown to create a strip set. Press seam allowance towards the darker strip. Square up one end of the strip set and then cut (2) 4-1/2" segments from it. Beginning at the squared up end, cut (2) 4-1/2" segments. Flip one unit around (top row, center illustration) so that like colors are aligned diagonally from each other. Sew the two units together, matching edges and the center seam. Press. Square up one end of the strip set and then cut (2) 2-1/2" segments (bottom left illustration, the vertical bar with brown ends). Sew a 2-1/2" x 8-1/2" bar to the top and bottom of your block center as shown, lower left illustration. Press seam allowances towards the block center. Sew the strip pieced frame units (with brown ends) to the remaining edges of the block center as shown, matching edges and seam intersections. Press. The quilt block. It should measure 12-1/2" x 12-1/2". Use the patches cut on page 1 to create units that look like the cut segments, pressing as described. Once patchwork is complete, the block assembly is the same. The wall hanging is made by constructing nine unequal nine-patch quilt blocks and separating them with setting squares and setting triangles. The quilt has a 3" wide border. Finished quilt dimensions: about 57" x 57". Cut (4) 12-1/2" x 12-1/2" dark teal squares for inner setting squares. Cut (2) 18-1/4" x 18-1/4" squares of light teal and then cut each square in half twice diagonally to produce setting triangles. Cut (18) 2-1/2" x 8-1/2" frame bars from your light fabric. Beginning quilters should learn how to cut long strips of fabric before you begin. To strip piece the frame bars with brown ends, cut (2) 2-1/2" x selvage width brown strips and (1) 8-1/2" x selvage width light strip. Construct strip set as instructed previously, with brown strips sewn lengthwise to each side of the light strip. Press, square up and cut as many 2-1/2" segments as possible (likely 16). Construct strip set for remaining two segments as directed on page 2. To strip piece the block centers, cut (2) 4-1/2" x dark teal strips from selvage to selvage; cut (2) strips of dark teal the same size. Sew a dark teal lengthwise to a light teal and press seam allowance towards the dark strip. Square up the strip set and cut as many 4-1/2" segments from it as possible (likely 9). Repeat with the remaining strips to make (9) more segments. Assemble (9) block centers as directed on page 2. Add an inch or so extra to the total for squaring up. Assemble each block as directed on page 2. Make (9) blocks. The quilt blocks are sewn together in diagonal rows and then joined. Use the Got Blues assembly diagram and instructions as a general guide. Use 3-1/2" wide strips of fabric to create the borders. (Quilt Border Instruction.